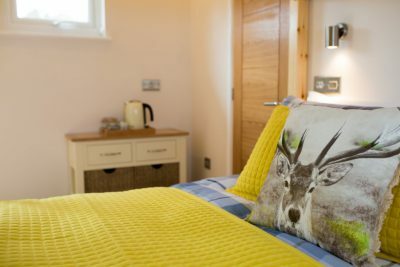 Applewood Countryside Park, one of Norfolk’s premier campsites, has unveiled five new luxury Shepherd’s Cabins. Working with local carpentry firm, Daniels & Vincent, these en-suite holiday cabins have been custom designed by the Applewood team to meet a growing demand for family-friendly glamping accommodation. Based on a traditional Shepherd’s Hut, these fully insulated and heated cabins have high curved ceilings offering plenty of natural daylight. Sleeping up to 5 guests, each cabin has a living room with a sofa to relax upon and a cosy eating area with dining table and benches, as well as a fully fitted kitchen that leads out onto a private deck for al fresco eating. All have deep king-size beds with two overhead single bunks, perfect for families with children. Glamping in true style means a private en-suite bathroom, where guests can enjoy a rain shower, sleek vanity mirror and fluffy hotel-style towels. We’ve created a luxury glamping experience at Applewood Countryside Park with something for everyone, from our cosy Glamping Pods to our super luxury Shepherd’s Cabins. “We really have given a lot of thought into creating the perfect finish to our Cabins. There is a selection of board games in each one as well as a freeview fitted TV for rainy days and cosy evenings. Plus dog beds and treats so four-legged friends can join the holiday fun too!” Karen adds. The interior furnishings differ across the five cabins to encourage guests to return and try a different one each time. One cabin stands apart, nicknamed the ‘couple’s cabin’ it offers a more romantic vibe, with a bathtub perfect for two, bathrobes and luxury toiletries. Prices start from £270 for a three-night stay from Friday to Monday. To find out about the latest news and offers, follow Instagram @ApplewoodGlamping and facebook.com/applewoodglamping.